Chidambaram is about 50 km south East of Neyveli noted for its ancient Nataraja Temple and the Famous Annamalai University. Chidambaram is globally known for its Nataraja temple. The dance of Lord Nataraja symbolizes the process of continuous evolution and destruction of the universe. Annamalai University is one of the oldest educational institutions in south India. It is located in the temple town of Chidambaram 250 km south of Madras. Annamalai University was founded by Raja Sir Annamalai Chettiar in 1929. From its humble beginnings as Meenakshi College, it has now grown into one of the largest private universities in India. The University has many faculties now including Engineering, Medicine, Music, Dentistry, Pharmacy, Arts & Sciences, Physical Education, Agriculture and many more. The main campus now is spread over 744 acres to the east of Chidambaram. 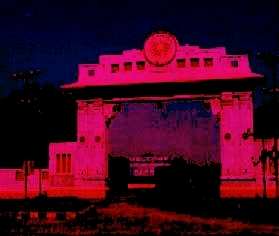 The University has grown to such an extent that it is more of a "Twin Town" to Chidambaram than a suburb. Annamalai University offers Graduate and Undergraduate level courses in almost all fields. Perhaps the most famous field is the 'Distance Education' where people from various walks of life are able to continue their education through correspondence courses.